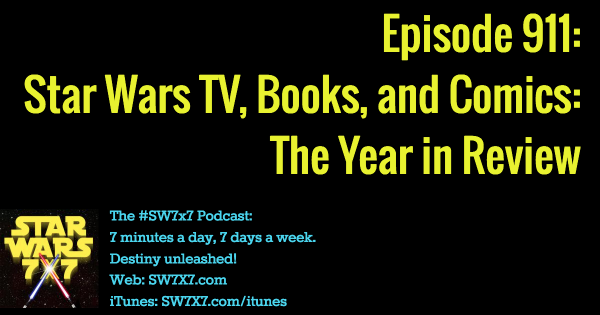 I’d intended to do a longer and more in-depth look at 2016 for Star Wars books, TV (okay, Rebels, since there isn’t any other Star Wars TV happening – yet), and comics. But then the whole Carrie Fisher thing happened, and the best laid plans, blah blah blah. Yes, I’m complaining. I’d much rather have been able to do those episodes, because it would’ve meant that we still had Carrie Fisher with us. In this, the final podcast of the year, I’m looking back at the novels, Rebels, and comics that made 2016 great. And speaking of Carrie Fisher, if you need to “hear” her voice again, check out Bloodline by Claudia Gray, in which she’s the main character. Claudia has her down pat, and it’s like Carrie’s in your head all over again. Until next year, on behalf of Brainstormer Lani, Quizmaster Joe, and Scorekeeper Declan, this is your host Allen Voivod wishing you a happy and healthy new year. May the Force be with you, wherever in the world you may be listening.